The holidays are here. They are always festive and special times at Lake Tahoe. 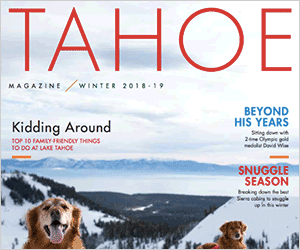 Hopefully the snow gods continue to bless us with more white, fluffy stuff, so we can all get out and enjoy the magic of Tahoe’s snow-covered mountains. Now is probably a good time to talk about what else happens during the holidays when it snows. We go sledding — wherever we can find open hills with nearby parking. When full of people, these places tend to look like resorts, the throngs screaming in delight as they shush down the hills. In reality, they are open spaces with very little land management. In the summer, they would just look like pretty parts of the forest. What does that mean? It means there probably won’t be trashcans nearby, there won’t be park rangers or friendly staff, and there won’t be anyone there to remind you to take your belongings with you when you go. Unfortunately, as we have seen in years past, at the end of the day this can mean sled hills covered in litter and broken sleds. We get it, when it is cold and your kiddo has just bonked themselves on the way down the hill it is easy to make a mad dash to the warmth of your car. If there isn’t a trash bin, it can seem fine just to leave your now mangled sled by the pile of other mangled sleds. But let’s be clear, it’s not really OK. It doesn’t take much to remember the principles of Leave No Trace. Take only memories, leave only sled tracks. Please remember to take home anything you bring with you to the sled hill. Broken sleds can be easily tossed in a garbage at home. Litter can too. Don’t be afraid to speak up for the mountains and remind others of this too. If we all do our part, we can make sure our mountains feel as loved as we all do on the holidays.